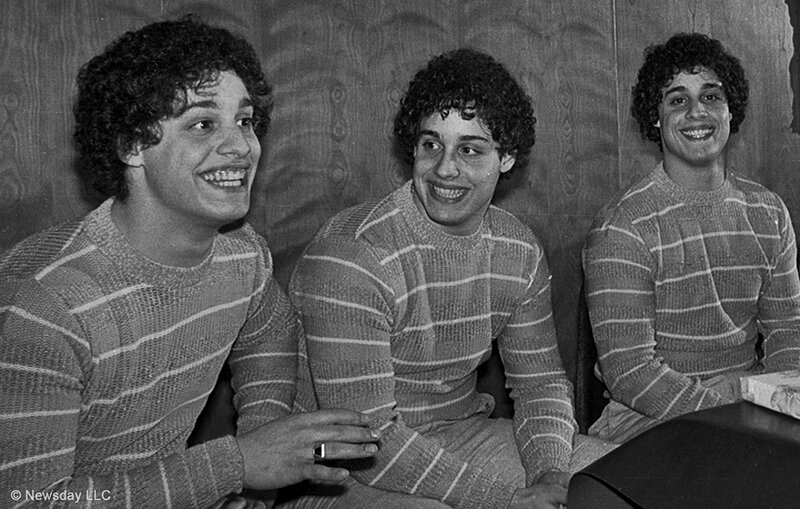 The first half of Three Identical Strangers will delight you – no doubt of that. The second will take you to far darker places and send you out with a head full of unanswered questions. Credit director Tim Wardle with having the courage to tackle a true story that throws a complex issue into the public discussion before the elements are even clear. There’s great fun to be had as we watch Robert, Eddy, and David as they discover they are identical triplets. Born in 1980, they are 19 when we meet them and they find each other. We smile at their fun as they discover the exactness of their physical movements and voice tones. We watch in pleasure as they start a restaurant named “Triplets.” And then we join in the director’s confusion as he discovers that the Louise Wise Services adoption agency – working with Dr. Peter Neubauer, a German psychiatrist, never told the adopting couples that each of their new sons was one of triplets. Dr. Neubauer – who died in 2008 was studying the three in secrecy and had sealed all his documents at Yale where no one can see them until 2066. The three boys, now adult men, are dealing with the unsettling certainty that for all their lives they have been objects of an organized secret study run by psychiatrist Dr. Peter Neubauer in partnership with the Louise Wise Services Adoption Agency. When the triplets, who have grown happily from teenagers to adulthood, discover this dark truth, they are wrapped in confusion. Who did this? Why weren’t they ever told they were triplets? Their story is stored at Yale? In an effort to unravel the secret cooperation between the psychiatrist and the adoption agency, director Tim Wardle introduces us to various witnesses and principals. Sadly, most of that ends in confusion for the audience. We meet the adoptive mothers who knew nothing of the plot. What did the agency tell them? We meet the odd birth mother and the wives of the triplets. Who is Neubauer? He is dead. We meet the woman who worked for Dr. Neubauer. As we wrestle with the questions each introduction raises, resentment grows at the secret study that has affected the personal lives of so many people. As all that unfolds, we begin to see the cruelty and violation of human rights inflicted by Neubauer and the adoption agency. What started as an exploration of the perennial dilemma of nature vs. nurture was rooted in the cruelty of a study by a professional who violated a whole string of moral and legal rules in secret. You will develop your own theory of why Dr. Neubauer secured the future of his work in 66 boxes at Yale where it would be safe until everyone is dead, including himself. The degree to which biology is, and is not, destiny is riveting. The cruelty of one man who hurt so many while studying that question is tragic. This review was posted on July 22, 2018, in Documentary. Bookmark the permalink.